Folding Knife Storage Carrying Display Case Holds 40 Knives. Great way to carry and display your knives. Check out our other Items!! 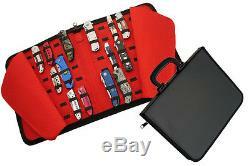 The item "Folding Knife Storage Carrying Display Case Holds 40 Knives NEW" is in sale since Thursday, April 10, 2014. This item is in the category "Collectibles\Knives, Swords & Blades\Blade Parts, Supplies & Accs\Boxes, Cases & Pouches". The seller is "sundevilgifts" and is located in Mesa, Arizona. This item can be shipped to United States.